Atom AAA Western Division Champs! Great job to the Atom AAA for defeating Cambridge at Cambridge for the Division Title! 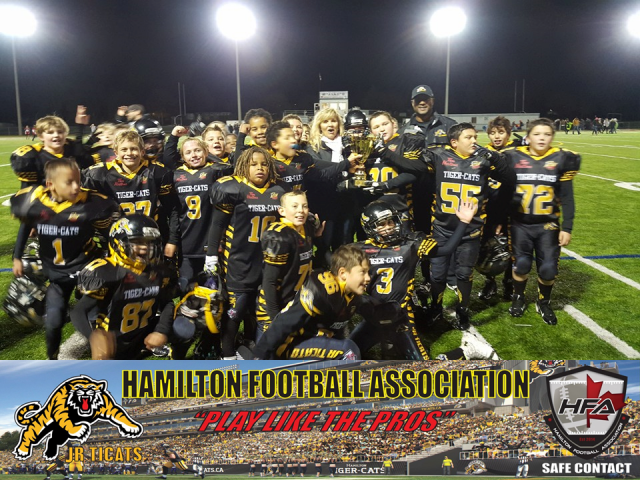 It was a cold and wet Saturday afternoon, but that didn't stop the Atom AAA Jr Ticats from beating the Cambridge Lions in what was dubbed "The Battle of the Big Cats" at Cambridge last night. The Jr Ticats declawed the Cambridge Lions in an epic 35-6 win becoming your new Fall OVFFL Atom AAA Western Division Champions! Coach Cartier and his team will move on to the Provincial Championship to be played in Oshawa on Sunday, November 15. More details will be posted as soon as it is received.